Potchefstroom is an academic city in the North West Province of South Africa. It hosts the Potchefstroom Campus of the North-West University. It is situated on the banks of the Mooirivier (Afrikaans for "pretty (or beautiful) river"), roughly 120 km (75 mi) west-southwest of Johannesburg and 45 km (28 mi) east-northeast of Klerksdorp. There are a number of theories on the origin of the name Potchefstroom. Firstly it is said to come from 'Potgieter' + 'Chef' + 'stroom'. This refers to the Voortrekker leader and town father Andries Potgieter, "chef" being an indication of leader of the voortrekkers and "stroom" referring to the Mooi River. According to the South African writer Geoffrey Jenkins, "Others however, attribute the name as having come from the word 'Potscherf', meaning a shard of a broken pot, due to the cracks that appear in the soil of the Mooi River Valley during drought resembling a broken pot". M.L Fick thirdly suggests that Potchefstroom developed from the abbreviation of "Potgieterstroom" to "Potgerstroom" which in time became "Potchefstroom". However, this doesn't account for the use of "Potjestroom" which is found as inscription on many documents and photographs. In 2006 the local African National Congress-controlled municipality decided on a name change for the city, the municipality and a number of important street names, favouring 'Tlokwe' as the new name. In 2007 the local municipality was changed from Potchefstroom Municipality to Tlokwe Municipality. The town, founded in 1838 by the Voortrekkers, is the second oldest settlement of people of European descent in the then Transvaal. The honour of oldest European settlement belongs to Klerksdorp, situated approximately 40 km (25 mi) to the West. This is sometimes challenged by historians because the first settlement was in the "upper regions of the Schoon Spruit", which might be between Klerksdorp and Potchefstroom. Potchefstroom however was the first to develop into a functional town. For a short time until 1840, the towns of Potchefstroom and Winburg as well as their surrounding territories were joined in a political entity known as the Republic of Winburg-Potchefstroom. Voortrekker leader Andries Hendrik Potgieter was elected as chief commandant. In October 1840, after a meeting between Potgieter, Andries Pretorius and G.R. van Rooyen it was decided that Potchefstroom would unite with "Pieter Mouriets Burg" (Pietermaritzburg). In 1848 Potchefstroom became the capital of the ZAR, a status which was affirmed by Britain in 1852. Over 16 and 17 January 1852, the Sand River Convention was signed between Andries Pretorius representing the Boers and Major W.S Hogge and Mr C.M. Owen representing Britain. According to this convention the British Government would allow the emigrant farmers north of the Vaal river to govern according to their own laws, with a policy of non-interference from both sides. This signalled the establishment of the Zuid Afrikaanse Republiek (ZAR) (South African Republic in English). In article 17 of the Constitution of the ZAR of 18 February 1858 (which was accepted in Rustenburg), it was stated that "Potchefstroom, located on the Mooi River, would be the capital of the Republic and that Pretoria would be the seat of government". In May 1860 Potchefstroom became the "chief city" of the Republic, with the capital having moved to Pretoria. On 16 December 1880, the first shots of the First Boer War were fired when the Boers laid siege to the old fort. The siege ended amicably on 23 March 1881. The British built a concentration camp here during the Second Boer War to imprison Boer women, children and elderly men. At the opening of the City hall in 1909, General Jan Smuts, the then Colonial Secretary was asked about the possibility of Potchefstroom becoming the capital of the Union. He replied that the city stood no chance, but said that it should aim at being South Africa's biggest educational centre. This has led to the strong educational inclination of this, the 'city of expertise'. Since 1997 the town has hosted to the annual Aardklop Arts Festival, an predominantly Afrikaans arts festival held in late September each year. The Potchefstroom municipality, which encompasses several neighbouring settlements, has a population of 128,357, according to the 2007 community survey. Of these, 69.6% were African, 27.0% White, 3.0% Coloured and 0.4% Asian. Voting population during 2011 local elections was 85945 according to the IEC (http://www.iec.org.za) representing 75% of the adult population which brings the adult population to approx 120,000. If the population under 18 is added, the population figures should be closer to 200,000 in 2011. In 1912 a resident of Potchefstroom, Ken McArthur won a gold medal at the Stockholm Olympics in marathon. McArthur was famous in his former North Antrim home village for his training routine which consisted of racing the narrow gauge railway train. The North-West University, a merged tertiary educational institution that was created on 1 January 2004, with campuses at Potchefstroom, Mafikeng and Vanderbijlpark. The Potchefstroom Campus (formerly the Potchefstroomse Universiteit vir Christelike Hoër Onderwys, founded in 1869) is the largest and the head office of the University is situated there. With its merged status, the North-West University became one of the bigger universities in South Africa with approximately 32, 000 students (full-time and distance education students) and is still growing. The Potchefstroom College of Education, originally the Normal College, which was founded in 1919. 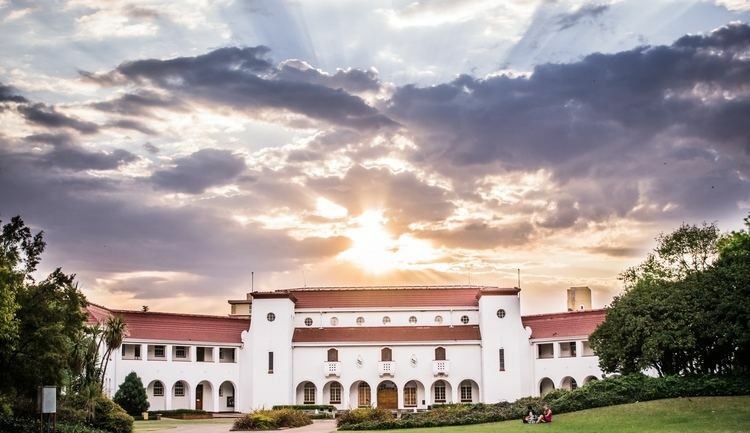 Initially the College was housed in galvanised iron buildings on the same premises as the Potchefstroom High School for Boys, and it moved to its present location in 1923. The College of Education was incorporated with the University on 1 January 2001. The Technical College Potchefstroom, founded in 1939 when the Union Education Department started "continuation classes". The annual increase in student numbers bears testimony to the important role played by this tertiary body. The Agricultural Centre, previously known as the Experimental Farm (1902) and Agricultural College (1939), is the largest single agricultural service point on one terrain in Southern Africa. The centre houses the headquarters of the Highveld Region of the Department Agriculture, the Grain Crops Institute as well as the Agricultural College with its modern training facilities. An internationally recognised breed of chicken, called the Potchefstroom Koekoek was developed here. CTI Education Group, a registered private higher education institution specialising in Information Technology opened its doors in Potchefstroom in 1998. In 2007 the Midrand Graduate College merged with CTI and instruction started in Commerce, Creative Arts & Graphic Design, Psychology & Counselling, and Law. CTI is now situated in Esselen street on the Built. Potchefstroom Akademie, founded in 1981 by managing director Tina Schöltz and offers tertiary education in the fields of Somatology, Health and Skincare Therapy, Holistic Health Therapies as well as Interior Design and Decorating. Potchefstroom High School for Girls: The school was originally known as the Central School and was established in 1874. Girls High was founded in 1905 when the Central School was divided into separate High School for boys and girls. Potchefstroom High School for Boys, established in 1874; it has been on its current site since 1905. Potchefstroom Gimnasium, founded in January 1907 as "Die Voorbereidende Skool" with HJJ van der Walt as its first principal. The preparation work which the schools did was in getting young men ready for theological studies as part of the Potchestroom University, the school later moved to its current location. On 25 January 1915, the school changed its name to Goeverement Skool. A year later it became the first school to start using Afrikaans as well as Dutch and English, making it the first Afrikaans High school north of the Vaal river. In 1918 it became solely a high school and changed its name to Potchefstroom Gimnasium. The Hair Academy of South Africa (THASA) was founded in 2008 by Elsabe Sheppard. THASA is registered with DHET and provides national as well as international hairdressing qualifications. The town also offers a wide range of public primary schools and high schools in the town's various townships, such as: Boitirelo Primary School (Corner Mamogale And Raditsabeng Street, Ikageng), Lesego Primary School, Boitshoko High School, Tlokwe High School. Potchefstroom is known as the North-West Province's "Home of Sport". The provincial headquarters of 17 of the most important sports are situated in the city. The City Council places a high priority on the establishment, maintenance and upgrading of the sport facilities under its control, especially to meet the variety of sporting and recreational needs of its youthful community. The Mooi River trails as well as other trails add extra colour and variety to these facilities available to resident and tourist alike. Cricket is a very popular sport with Senwes Park being the Home of Cricket for the Highveld Lions. Potchefstroom hosted matches during the 2003 ICC Cricket World Cup between Australia and the Netherlands, Australia and Namibia, and also between South Africa and Kenya. Potchefstroom were also co-hosts for the 2009 Cricket World Cup Qualifier. The Proteas chooses Potchefstroom on a regular basis as their destination for off season training camps. And, from time to time Potchefstroom will also play host to the Australians during off season cricket camps. During the 2003 ICC Cricket World Cup, Australia's cricket team chose Potchefstroom as their home base. They also went on to win the World Cup. Rugby is arguably the most popular sport in Potchefstroom. Olën Park is the main rugby stadium and is mostly used for Rugby Union matches by the Leopards Rugby Union in the first division of the Currie Cup, as well as the Vodacom Cup. The stadium is also used for football matches and has hosted a few matches for the South Africa under-23 football team. Jomo Cosmos, a PSL team, recently relegated to NFD also uses the stadium to host some of their matches. Profert Olën Park was named after Carl Ludwig Theodor Olën who was the President of the Western Transvaal Rugby Union during the period 1922 to 1934. In recent times a local fertilizer company situated in Potchefstroom, Profert has been contributing not only financially but also with their products and expertise, towards the upkeep of the playing field and as thus obtained the naming rights of the stadium. There is also the Fanie du Toit Sports Grounds located on the North West University. The main rugby field on the sports grounds have also seen a few games of the Leopards. It also plays host to the PUK's (NWU) Varsity Cup matches which always sees a full house of locals and students supporting the Pukke (NWU) rugby team. Potchefstroom has produced numerous other famous spol team|La Roja]]" during the FIFA 2010 World Cup introduced a new level of sporting exposure to Potchefstroom and the NWU. The Spanish national football team, who went on to win their first ever FIFA World cup title, chose Potchefstroom to be their base camp for the 2010 FIFA World Cup. To prepare for the team a new sporting complex was built at the North West University and the local airport was extended to host large passenger planes to land. st others the Potchefstroom area. Mayor Maphetle Maphetle (ANC) was dismissed late 2012 after a motion of no confidence was passed and Prof. Annette Combrink from the opposition (DA) was elected mayor. Only 3 months later a motion of no confidence was passed on Prof. Combrink and Mayor Maphetle Maphetle was reinstated. Since then, the Municipal Council's seats as well as the mayoral position are heavily contested during each election. Since the inception of the Heritage Resources Act of 1999, monuments are classified as grade I (National), grade II (Provincial) and grade III (local). Many previous national monuments were downgraded to provincial level (grade II). Old Fort and Cemetery, c. 1881: It is an earthwork quadrilateral, west of Potch – Klerksdorp railway line and south of Potch – Klerksdorp main road. The fort was built by British soldiers under the command of major RWC Winsloe during the Anglo-Boer War in 1880. The British troops were besieged in the fort by the Boers for 95 days and a number of soldiers and civilians who died during the siege are buried in the adjoining cemetery. Declared in 1937 (Item 27046 in SAHRA registry). South African National Artillery Memorial: This is the South African National Memorial Site for all Artillery Soldiers who died in combat during World War II. The Memorial is in Kanonierspark on the Ventersdorp Road. The W D Pretorius House, c. 1853: Willem Daniel Pretorius obtained this house and outbuildings – the residence of a farm adjacent to the town – in 1888. Extensions and changes to the house were started immediately. His initials and date (WDP- 1888) were inscribed on the front door of the new facade. He was the great grand nephew of the president MW Pretorius. A small school was accommodated in one of the buildings, forerunner ML Fick Primary school. The Mooi Rivier Dutch Reformed Church was founded on these premises in 1917. The site is on the corner of Walter Sisulu ave and Smit street. It was declared in 1987 (Item 27354 in SAHRA database). Nederduitsch Hervormde Kerk (Church), c. 1859: The original cruciform church with earth floor and thatched roof was supplied with a tin roof with decorative cast iron horsemen and exceptional pointed spire. With the improvement of 1892 a plank floor, galleries, church pews, ceiling and proper lamps were put in. Later on an organ gallery was built, and a pipe organ imported from London and transported by train and ox-wagon. The building's cornerstone was laid on 26 December 1859, but the building itself was consecrated on 25 February 1866. Building was interrupted in 1863-4 by the civil war. The church is in Walter Sisulu ave (opposite the Town Hall). M W Pretorius House, c. 1868: The President Pretorius house is of traditional Cape style with white plaster and traditional thatched roof. It consists of a 1,3230 hectare property with the original main residence, wagon house and stables and smithy. The site also contains huge oak trees planted by M.W. Pretorius. This house was declared a monument in 1979 (Item 27047 in the SAHRA register) and has been converted into a house museum. Berlin Missionary Complex, c. 1875: This building looked the same as the Berlin Mission Church in Pretoria: a small hall in "fortified" colonial Gothic Stylistic elements. It initially had a thatched roof, as well as a dung floor; the thatched roof was replaced by a tin roof in 1956 while a parquet floor and a gallery were added. Some smaller changes were also made since 1938 when the newly established Evangelical Lutheran Congregation came into being and used the Mission Church. The Gereformeerde Church Mooi Rivier now own the building. It is on the corner of Sol Plaatjie and Du Plooy streets. St. Mary's Anglican Church, c. 1890: The building is ascribed to John William Gaisford, the first Potchefstromer known to have acted as architect. Originally the church had a high-pitched thatched roof, lancet, windows and a mud floor and no ceiling. Situated in Auto Street. Dutch Reformed Mother Church Potchefstroom, c. 1895: This church with gothic style elements was constructed on the design of the master builder Wocke. President Paul Kruger laid the foundation stone on 13 Feb 1894. It was a temporary hospital in the Anglo Boer War. The Reverend Beyers Naudé was a reverend at this church before his own resistance against the political system. The church was nearly devastated by a fire on 13 March 2007 but was restored by 2009 and the new organ was inaugurated in September 2011. The church is on the corner of Beyers Naude and Nelson Mandela Drives. Old Fourth Prison, c. 1898: The fourth prison was built on the current site, before the outbreak of the Anglo Boer war (1899–1903). It was used as a prison and later as the HQ of the Potchefstroom Commando till 1998. This building is in Auto Ave and now houses the Tlokwe Youth Centre. Old Post Office building (Landdrost Post en Telegraafgebou), c. 1897: This building, situated in Greyling street was declared in 1991 (Item 27142 and 27144 in SAHRA register). Theological School Complex, c. 1905: The old Theological School complex in Molen Street is both a symbol of the training of the Reformed Church (Gereformeerde Kerk) and of teaching through the medium of Afrikaans at primary, secondary and tertiary level, the latter because both the Mooi River Primary School, Gymnasium High school (probably the first in the country which offered teaching in Afrikaans rather than in Dutch) and the PU for CHE grew from this Theological School. The complex is in Molen Street. Totius House, c. 1905: The site came into use in 1905, like the Theological School Building. In design it is practically a replica of the professor's residence in Burgersdorp (where the Reformed church seminary moved from). The first resident of the house was Prof. Jan Lion Cachet. He was succeeded in 1911 by Jacob Daniel Du Toit (Totius) as professor at the Theological School. Totius and his family lived in the house until 1924, and at least four of his volumes of poetry were created while he lived there. Totius also started his work on Afrikaans translation of the Bible, a task he continued on a farm at Krugerskraal. Today the house serves as one of the city's House museums and is situated in Molen Street. Selbourne Hall, c. 1909: This building on the Agricultural college is in a bad state of disrepair. Oak Avenue, c. 1910: The Town Council of Potchefstroom decided to plant an oak lane in 1910. The lane of 6.84 km stretches from the Agricultural Centre to the Lakeside Resort. The streets are Chris Hani Drive, Kock St, Dr Wolmarans street, Beyers Naudé Ave, Retief St, Peter Mokaba, Steve Biko and Calderbank Avenues. The site was declared a monument in 1977 (Item 27304 in SAHRA registry) and a stone beacon with bronze plaque for the lane was erected on the corner of Lombard and Kruger Street at the time. Commanding Officers House / Witrand Hospital Superintend house, c. 1913: Formerly house of the Commanding Officer of British Garrison in Potchefstroom, Also known as the "Generals House". Colonel SHC Monro was the first commanding officer of the garrison and the first resident of the house. Later the Witrand Care & Rehab Centre Superintendent House. It was declared in 1982 and is situated on the Witrand grounds on the Ventersdorp Road. It was declared a monument in 1982 (Item 27665 in SAHRA database). Heimat building, c. 1925: A double-storey hostel in the Neo Cape Dutch style was designed by Gerard Moerdijk was the first permanent building to be erected on the university campus. It was decided that it would be called 'Ons Huis' (Our Home). When the students occupied it, however, it was called the "Klimop" (Creeper). The students promptly dubbed it "Heimat" – and thus it remained, even after the building was re-allocated for academic purposes in 1980. It was proclaimed in 1984. This building on the Potchefstroom campus of the North-West University houses the University's Department of Culture. It was declared in 1984 (item 27194 in SAHRA register). The Roets House, c. 1926: The house was built by Jan van der Walt so that his son, Peter could stay at home while studying at the University. Later Mr. Hennie Roets, Principal of Mooi River Laerskool, occupied the house. This building is in 61 Steve Biko Ave. Declared in 1984. Main Building, University, c. 1930: The building was designed by architect Henri Louw from Bloemfontein. The seven arches on the building were meant to echo the seven candelabra in the logo of the university. It was inaugurated on 13 April 1931. It is a double-storey building which originally housed lecture halls, offices and the Library. The building was declared a monument in 1984 and now houses the Faculty of Law (building G5). Rector's Residence, 1 Calderbank ave: This building, which has a Tudor style was declared in 1999 (Item 27680 in SAHRA database). 72, 74 and 76 James Maroka Ave: These three houses were declared in 1991. Kohinoor Cinema, Walter Sisulu Ave (c. 1950): Kohinoor Cinema is situated along Walter Sisulu Avenue, in Makweteng, now known as Mieder Park. It was built in the early 1950s. This is where the community used to watch movies in the 1950s, 1960s and 1970s. It was also used for dancing competitions, notably, ballroom dancing, and weddings prior to the forced removals which started in 1958 until 1963. One of the most memorable events to take place on the site is music shows where Jazz performers such as the Twist Rovers, Spokes Mashiane and other groups from Johannesburg used to entertain audiences. Potchefstroom Station building (c. 1919) and Steam locomotive on forecourt from 1902. Potchefstroom Synagogue, James Maroka ave (c. 1920): The building houses the Potchefstroom Academy. Devil's corner, Ikageng (c. 1960): An open space which was and is still used by the Ikageng community/residents for various functions. In the 1960s it was used by women of Ikageng and surrounding areas for fashion parade. It is now used as a celebration venue for the Kaizer Chiefs Football Club. The site became notorious when local gangsters used it as a paradise or hiding place. Notably it was utilised by local activists and organisations as a meeting place. As the busiest intersection in Ikageng, the community also uses it as a place to display their grievances. Tlokwe Memorial Park, entrance to Ikageng (c. 2009): A Memorial Park under construction for the local activists who died during the liberation struggle. Cachet Park, Die Built (c. 1900): This area is utilised annually for the Aardklop National Arts Festival. The North-West University Botanical Garden, situated adjacent to the Potchefstroom campus of the North-West University. It covers an area of almost 3 hectares. Most of the plants in the Botanical Garden are indigenous with the exception of a few exotic plants which are of botanical or medicinal interest. A section of the Botanical Garden, around a man-made ridge, is managed as a natural field garden while the rest of the Botanical Garden is more intensively managed. A variety of mammals, birds, amphibians and fish have made the garden their home in recent years providing a whole new dimension to the Botanical Garden. The Witrand Mental Institute in Potchefstroom was the second Government institution for psychiatric patients and was opened in 1923. The first one, Valkenberg Hospital, was opened at Maitland in the Cape. Potchefstroom is an important industrial, service and agricultural growth point of North West Province. Industries in Potchefstroom include steel, food, and chemical processing. The chicken industry is of key importance with a number of major players situated around Potchefstroom such as Chubby Chick, Serfontein Poultry, Haagner's Poultry, Crown Chicken and Highveld Egg Cooperation. The headquarters of the NWC is situated in Potchefstroom and also accentuates the important role which the city plays with regard to the activities of the South African National Defence Force in North West Province.